1. 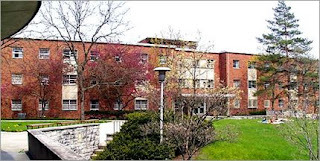 I have no Internet connection this year due to re-wiring in our dorm, so I do not have regular access to email or web. I'm at a coffee shop in Delaware to blog and upload pics. 2. We HAVE been taking pics and they are uploading to the flickr page as I type this. Pics from Sunday night through Tuesday morning can be found at the band picture page. 3. The kids have been doing a phenomenal job! Music is in good shape. We have blocked over half of the drill and put over half of the opener with music and drill together! 4. The weather has been great, and so has the food. 5. Skit night is tonight and we're very excited to see what everyone has come up with and to reunite with visiting parents and alumni. I have confirmed departure times for our football road trips, and they have been updated on the complete calendar of events. If you click on events on the calendar, you will get more info, including departure, performance, and return times. BTW, contest times and places are not confirmed yet, but will be soon. The dates, however, are set in stone! If you forgotta da password and username, be sure to email me. Originally uploaded by fhsbando. I have uploaded pics of the 2007 competition show drill. They're not perfect, but they are 5mp versions that you can zoom in and find your spots. Be sure to see the cover sheet for drill designations. Everyone will get a hard copy on Sunday at camp check in! Who Knew? Brian May Is A Talented Guy. 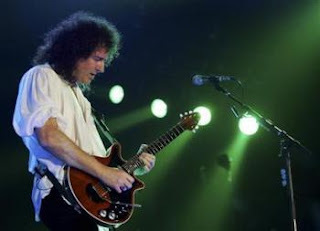 Brian May, lead guitarist for the 70's powerhouse of British Rock, Queen, will be awarded his PhD in astrophysics next year. He dropped his studies when the band "rocketed" (excuse the pun) to prominence. His thesis has been submitted and he'll get his degree next year. 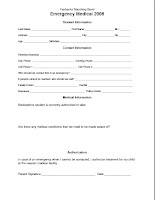 Please make sure you get your emergency medical form in at band camp check in. Make sure you notify me of all the important stuff that affects your livelihood at band camp, as well as medications you are authorized to take. If you lost your packet o' info, you can download one here or by clicking on the graphic. Originally uploaded by fhsbando. Pictures from Monday's parade have been posted on the picture page. Please check them out not only for fun, but to evaluate your performance. I have made some comments on what is good and what needs work. There are also some pics of the MHS band. You might want to compare! So...What Have I Been Up To? 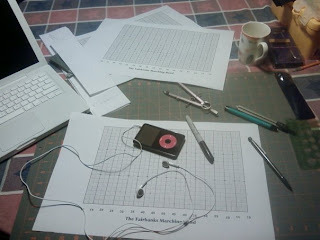 Well, after over 30 hours of work, the drill and visual design are on paper. I'm putting directions and counts on them tomorrow and the book will be done in time to copy on Friday. It's 38 charts long, with 22 of those in the opener alone. (I cleaned the floor after I was done and I threw away 28 pages!) After I get them copy-ready, I'll also scan them and put them up on the Flickr page for you to preview. It's an exciting and demanding drill. You will be out of breath by the end of the opener...but I promise you WILL be able to achieve, but not without effort and hard work. Check back Thursday for a "New World" preview! Mrs. Noland asked me to share this with you and I gladly obliged. Please contact her for further info. Help wanted! Saturday, July 28th 7:00am. Celebrate Christ Praise and Worship 2007. A group of local and national talented musicians will be performing from 11:00am - 7:30pm. We have 250 chairs to set up and could really use your help. Proceeds from the concert will benefit the start up efforts for "Young Life of Union County". A Christian based High School focused social outreach program. Please come and show your support of the Arts in Union County by setting up a few chairs. Originally uploaded by fhsbando. 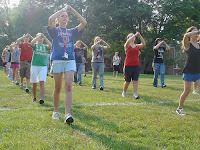 Pictures from today's 7/19 rehearsal have been added to the picture page. Please note the good horn angles and lack of phasing problems. In the picture on the right, look at the good left hand stick sync (they are playing) as opposed to the bad right hand sync. Pictures tell a lot and allow us to critique our own performance. Kenny and Sean asked me to put up their latest poster and I am glad to oblige. 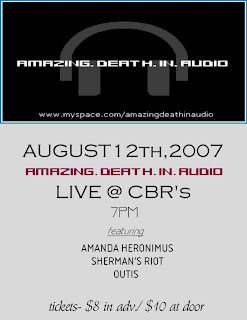 Click the pic for more info on Amazing Death In Audio and their next gig. If you are not planning on attending the fair parade on Monday and haven't told me yet, do it now. We're missing a lot of people for this debut performance and I must admit I am not happy about it. You all know that you need to give me two weeks notice to be excused from a performance...especially one that has been on the calendar since March. 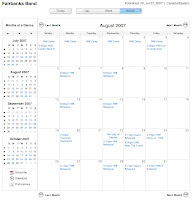 Back-to-school infoFMB Update 7/16/07Band Camp InfoPictures from Rookie CampCalendar of EventsCheck it out to be in-the-know! 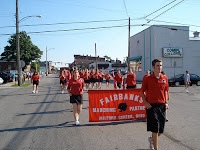 The first performance for the Fairbanks Marching Band will be at the annual Union County Fair parade on Monday, July 23. The parade starts at 5PM this year, so band members will need to be ready to warm up at 4:15 at the parking lot between the Marysville UMC and Veteran's Auditorium, on Sixth Street across from the courthouse. Originally uploaded by fhsbando. A few pictures that I took today are on the picture page. Check them out. I want to take this opportunity to congratulate those involved with today's rehearsals for a great start to this 2007 FMB season! Squad leaders: you set a fine example and did a great job of teaching this morning. I'm very proud of all of you. Rookies: You impressed me from the start. Your hard work and positive attitude have resulted in a strong set of marching fundamentals, good posture, and great details. Drumline: The new cadence sounds great, and both Brad and I were very impressed with the start you got on part one of the contest show. Outstanding! I lined the field today and it looks beautiful. Lines...dots...everything. Monday: Rookies and Squad leaders at 8AM until Noon. Drumline at 1PM until 4PM. I'll see EVERYONE on Tuesday! Air conditioning is going in at the Band room! 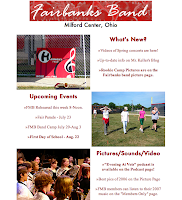 This is just a running reminder that the Fairbanks Marching Band begins rehearsal on July 16 at 8AM for squad leaders and rookies, and at 1PM for percussionists; and on July 17 at 8 AM for all band members. More information on what's going on and on band camp is available on the Marching Band page. This reminder will remain at the top of the blog all summer, so be sure to look below for quotes, quips, and information. Have a great summer! I'll be putting down the grid on the baseball outfield on Sunday at 2PM. Any FMB members interested in helping will get a treat, as well as get to eat first on Sunday night at band camp...as well as earn my eternal gratitude. Please RSVP if you can make it to fhsbando@gmail.com. See you there. I'm SO excited to get started on the 2007 FMB! I'll have limited internet access this week. If you must reach me, email me at fhsbando@gmail.com.